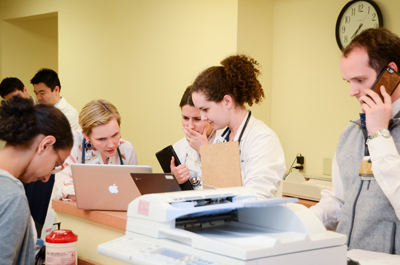 The Vanderbilt University School of Medicine student-run Shade Tree Clinic was founded in 2004 as a means to provide primary care to Nashville’s uninsured population and to allow medical and nursing students to receive valuable hands-on training while providing healthcare to those in need. Like the healthcare industry, the clinic has had to adapt to changes in insurance, patient demographics and the rise of chronic diseases among an aging population. Similarly, the Vanderbilt medical and nursing students and faculty who voluntarily deliver care at the clinic have had to adapt as well. In its early years, the typical Shade Tree patient was under the age of 50; now the clinic has a panel of 400 patients, many who are in their 60s and 70s, and 40 percent of whom are non-English speaking and therefore not eligible for Medicare. Two-thirds of the panel have chronic diseases including diabetes, hypertension, heart failure and chronic obstructive pulmonary disease. This is a drastic change from the clinic’s early days when patients would commonly come in for a blood pressure check, birth control or STD testing. Shade Tree, located on Dickerson Pike in a facility provided rent-free by Neighborhood Health, recently added psychiatry and neurology clinics. Other specialty clinics like orthopaedics and ophthalmology are held once a month. There is also an active Hepatitis C program. “We’re able to work these patients up and get treatment free through patient assistance programs. Hepatitis C drugs cost $60,000 to $90,000 for a treatment. We’re doing it for the cost of lab tests,” Miller said. All told, the clinic fills about 300 prescriptions per month at a cost of $8,000, paid for through donations and fundraising. Shade Tree’s budget has increased to about $160,000 a year, which primarily goes toward covering medications and supplies. Funds are raised through the Shade Tree Auction and Benefit dinner, which was held in February, and with the Shade Tree Trot, scheduled for Saturday, April 21. To register, visit https://racewire.com/register.php?id=8575. The clinic relies heavily on third- and fourth-year medical students and faculty who volunteer their time. Michael Fowler, MD, and Eleanor Weaver, MD, serve as medical directors along with Miller. “We believe that Shade Tree is an important service provided by VUMC, but it also has a mission to teach future providers how to care for underserved populations,” Miller said. More than 46 faculty provide care at the clinic, which is open Tuesdays from 6 to 9 p.m. and Saturdays from noon to 4 p.m.
“One of the greatest opportunities Shade Tree Clinic provides its student volunteers, including myself, is the ability to see first-hand how social determinants affect the health of real people, especially with regards to chronic disease management,” said medical student Josh Latner, co-executive director. “At Shade Tree, our student volunteers are involved in all levels of care. 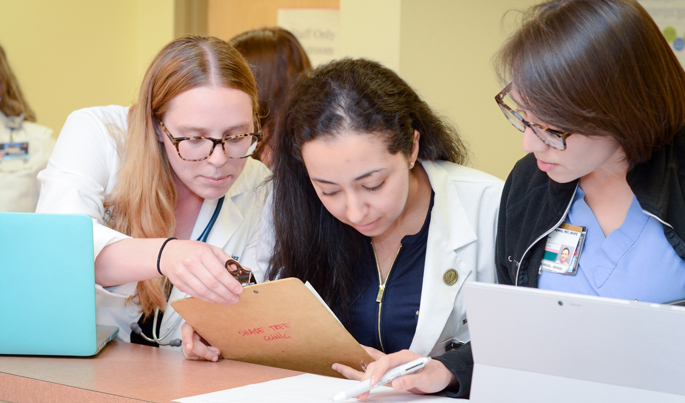 It has taught me the importance of empowering patients to direct their care and achieve their health goals,” said medical student Greg Fricker, co-executive director. With a growing patient population with increasingly complex needs, the clinic is more reliant on volunteer physicians than ever. To volunteer at Shade Tree, visit free.clinic@vanderbilt.edu.